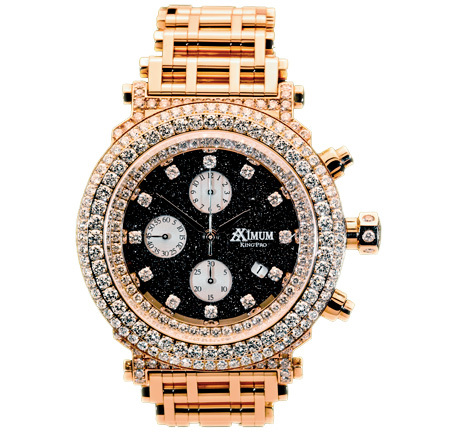 Socialite Kim Zolciak, famous for her participation in The Real Housewives of Atlanta, often wears her large Aximum King Pro watch in gold with diamond set bezel. The King Pro watch has a 48mm case and comes standard with 12ct diamonds (14ct are optional). This Aximum watch is available in Yellow Gold, Rose Gold and White Gold (it looks like Kim wears the Yellow Gold version).The see-through case back shows the ETA Valjoux 7750 Chrono Movement, Day/Date. Kim Zolciak's watch has the optional Gold bracelet (in stead of the standard leather / rubber / carbon fiber). The watch is designed by custom jeweler Aximum, a high end jewelry store in Atlanta and made in Germany. Find more information on the brand and the complete model range on aximumwatch.com. Kim Zolciak also wears another watch, which looks like a black Chanel J12 with black dial and diamond bezel. More on this watch here.